BMW has premiered the 2018 M5 at the Frankfurt Motor Show. The German super saloon is powered by a 600PS twin-turbocharged 4.4-litre V8 and features four-wheel drive as standard. 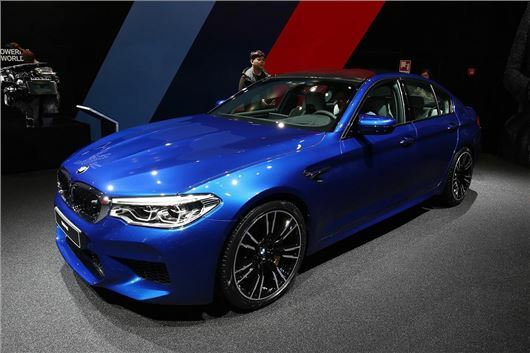 ﻿Prices for the sixth-generation BMW M5 will start in the region of £90,000 when it reaches UK showrooms in February 2018 and the reworked 4.4-litre V8 twin-turbo petrol engine will develop a grin-inducing 750Nm of torque from just 1800rpm – 70Nm increase over the previous M5. Based on the latest 5 Serie, the M5 will have space for five adults and feature 530-litres of boot space with the rear seats in place. It will also BMW's latest Professional Multimedia system too, with a 10-inch colour screen, navigation, media player and rear-view camera fitted as standard. The tyres have been developed especially for the M5 too, with 275/435 R20s at the front and 285/30 R20s at the rear. They are mounted on light-metal cast Double-spoke bicolour wheels.